Built in 1818 to replace a light over the Town Gate. This and the Low Lighthouse were used in transit to aid navigation into the harbour. Withdrawn from service in 1862 and now houses a museum of local interest. 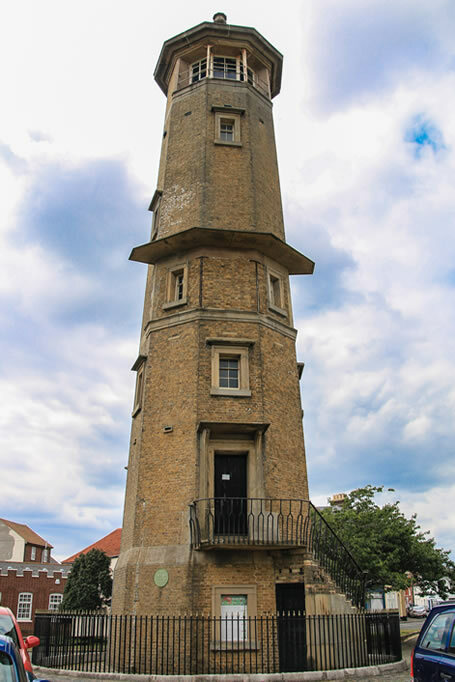 The lighthouses became redundant in 1863 for just this reason and the new cast iron lighthouses were erected at Dovercourt opposite the present tennis courts. The High Lighthouse continued to be used by mariners as a landmark. In 1909, the High and Low Lighthouses were sold to the Borough Council. The Low Lighthouse was vested in the Harwich Corporation for 10/- (50p), but with the condition that it should be returned to TH if needed for navigational purposes. The lighthouse became redundant in 1863 and the new cast iron lighthouses were erected at Dovercourt opposite the present tennis courts. The High Lighthouse continued to be used by mariners as a landmark. In 1909, the High and Low Lighthouses were sold to the Borough Council. The Low Lighthouse was vested in the Harwich Corporation for 10/- (50p), but with the condition that it should be returned to TH if needed for navigational purposes. TH in fact took it over again in 1970 and converted it into a pilot signal station. 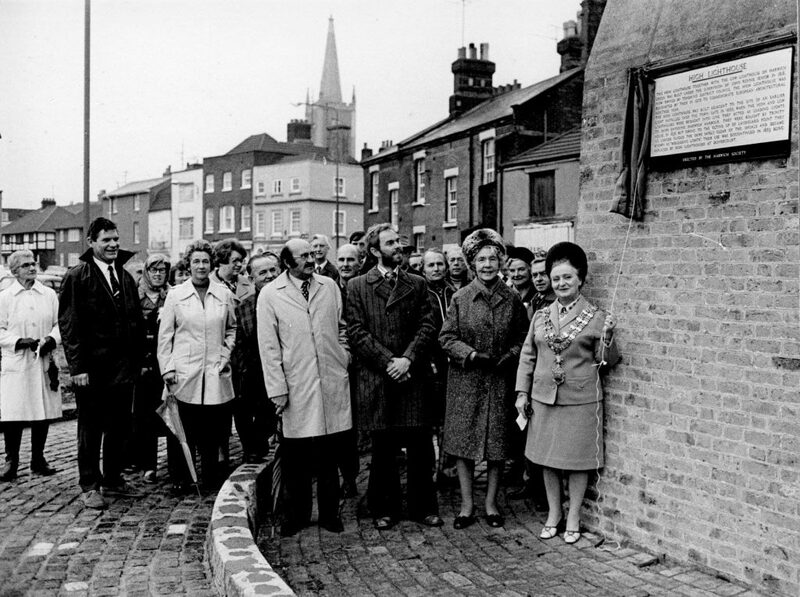 In 1974, it reverted to Tendring District Council (TDC) on completion of the new Pilot Station at Angel gate. It became the Maritime Museum of the Harwich Society in 1980. TH in fact took it over again in 1970 and converted it into a pilot signal station. In 1974, it reverted to Tendring District Council (TDC) on completion of the new Pilot Station at Angel gate. It became the Maritime Museum of the Harwich Society in 1980 and is open to the public daily from 1000 – 1600 1st May to the middle of September. October 30th 1976 saw the unveiling of our plaque on the High Lighthouse at Harwich. The morning was cold and drear but it did not deter about fifty faithful members from attending the ceremony which was performed by the Mayor of Harwich, Councillor Mrs Georgina Potter, Also present were the Chief Technical Officer of Tendring District Council, Mr C. Bellows, and Mr Henry Lambon and Mr Tom Judson, chairman and secretary respectively of the Colchester Branch of the Royal Institute of British Architects. The High Lighthouse is opposite the Train and Bus Station and there is free parking on the road nearby. Open to the public daily from 1000 – 1600 1st May to middle of September. Adults £1, accompanied children free. No concessions.